There are a lot of interesting developments occurring in the field of Linux smartphones right now. With so many different options popping up, fragmentation is a risk, as apps built on one platform fail to migrate to another. KDE's new offering may help to make those apps available to a broader audience. KDE Plasma Mobile is a new software stack for Linux phones, and it's designed to provide a user-friendly and open interface for users. The project still is in its early stages, but there is a working prototype, which you can see demoed in this video: https://www.youtube.com/watch?feature=player_embedded&v=auuQA0Q8qpM. 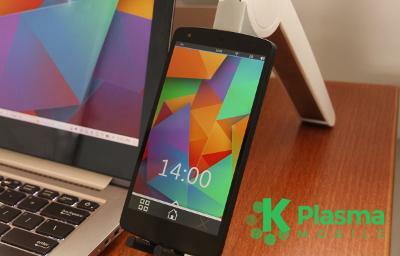 Unlike Ubuntu Phone or Firefox OS, KDE Plasma Mobile is not a complete operating system. It's a combination of packages that provides a user interface for a phone. It also exposes the features of the phone to user apps through software, such as Ofono and RIL. Currently, Plasma Mobile supports Qt apps, including KDE Desktop apps and Plasmoids. The platform also aims to support Ubuntu Phone apps (which are packaged by Snappy) and Android apps. The reason behind the project is to put users in control. Android itself may be an open platform, but most Android devices are tied into a specific App store by the manufacturer. And, the majority of Android apps are not free (in the "free speech" sense). The mobile app market currently favors proprietary apps with embedded advertising (which uses tracking in order to target ads better) and in-app purchases. This is in addition to apps that demand access to users' social media accounts and other private data. Users actively are blocked from installing apps from other sources, and they often have to go through a complex procedure of "rooting" their devices just to be able to install software that isn't in the stores. For users who are concerned about privacy and freedom, smartphones can be a bit of a nightmare. KDE's platform puts the focus on open-source apps and creates a level playing field on which developers can construct programs that are native and portable (thanks to Qt). At the same time, users will be free to add apps, such as Google Play, and install Android apps as they wish. Plasma Mobile is an interesting project for developers too. By leveraging familiar technologies, such as Qt and dbus, it will be easier to port existing apps and create new ones, without having to learn idiosyncratic APIs (such as the Android API and Google Play API). Although there is a working prototype, the project isn't fully complete yet. Qt and KDE apps can be seen running smoothly in the demo video (link above), but there currently are no supported Android apps. However, KDE also is working on the Shashlik project, which allows Android apps to run in a GNU/Linux environment, so it looks like KDE will be able to live up to its promises. Source code for Plasma Mobile is available in the Git repos at https://projects.kde.org/projects/playground/mobile.